Ready to take your yoga teaching journey to the next level? Join our 300 Hour Yoga Teacher Training. The Thrive 300-Hour Training balances old world understanding of yoga with the explosion and expansion of what yoga is today. The training at Thrive blends the technicalities of teaching yoga with training other healing modalities that we have seen move people to freedom, health and happiness. The Thrive 300-Hour Training also includes Reiki 1&2 Certification. Note: Apprentice, mentorship, and teaching opportunities are available to Thrive training graduates. Apprenticeship in planning and teaching Workshops. Transform your practice with one-on-one attention from expert yoga teacher trainers in their specific fields. Develop self-awareness and yoga teaching skills that translate beyond the mat to everyday life. Receive in-depth training on the various topics listed below. Gain lifelong community with warm-hearted, like-minded seekers on their yoga path. Bring your teaching experiences into the classroom. Try new sequences, move beyond your comfort zone to become an amazing inspired teacher. Dates TBD, Join our email list to be notified when we have the Spring YTT dates. Trainees with schedule conflicts will be able to make-up missed lectures in one of the future Thrive 200-hour trainings at no cost or by attending another program with an equivalent curriculum. Other make-ups can be scheduled for a fee. An application must be submitted with the deposit. We will charge your deposit after acceptance into the training. Why apply for the Teacher Training at Thrive? We walk our talk. This training is great for you if you are looking to deepen your practice or become a confident and knowledgeable yoga teacher. Thrive Teachers are from Thrive Trainings. Take our classes and experience yoga with our teachers. We are committed to your growth. The Thrive Yoga Trainers encourage trainees to see their potential as a yogi and as a calm and vital human being. You will deepen your practice and transform your life. Our training is proven. 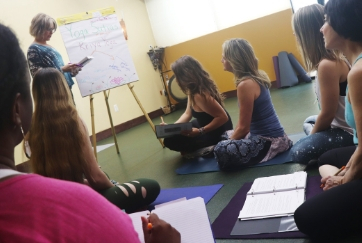 Thrive training programs were first introduced 10 years ago and have graduated nearly 350 unique teachers and inquisitive yoga students. Experience. Our faculty is a TEAM of expert yoga instructors and lecturers with broad experience in their fields. Our Trainers are RYT-500 Accredited Yoga Trainers. Yoga Authors, and leaders in their fields. Modern yogic wisdom. We evolve and improve the training based on new research and innovations in yoga and in the field of wellness.